With age, visible changes take place in brow shape and position. The eyebrows descend, sometimes asymmetrically. This descent can make the eyes look small and the upper lids appear too full. The eyebrow position and shape play important roles in our gender and youthfulness. In men, eyebrows are minimally arched and usually run at the level of the superior orbital rim or the upper bony arch of the eye socket. In women, ideal brow position is a few millimeters above the bony prominent with an arch at the 2/3 point to create a feminine look. In mild instances, eyebrow descent can be addressed with nonsurgical means such as BOTOX injections (a chemical brow lift). In more severe cases, a surgical approach may be considered. Our board-certified otolaryngologist & head and neck surgeon, Dr. Masoud Saman can improve the positioning of the eyebrow with a brow lift, which revitalizes the face and creates a younger appearance. Dr. Saman offers brow and forehead lift procedures to patients in Dallas, Plano, TX and other nearby areas. To learn more about brow lifts and to determine if the surgery is right for you, contact our office today to learn about important financing information and get answers to your questions. Saman ENT & Facial Plastic Surgery serves the communities of North Texas. At the time of your consultation with Dr. Saman, a facial analysis will be performed, and all risks and benefits of the procedure will be discussed. In addition, you will have the opportunity to address your concerns and questions with Dr. Saman at length. Photos and computer simulation will be accomplished at the time of the preoperative appointment. During the day of surgery at our accredited and state-of-the-art surgical facilities in Plano, you will be under a general anesthesia for 1 – 2 hours during the surgery. An endoscopic brow lift requires four small one-inch incisions well hidden in the hair-bearing areas of the scalp. Dr. Saman then performs the procedure through these incisions using a small camera with a monitor and specialized instruments. The skin will be repositioned and sutured closed. You will recover in our post-operative recovery room and monitored by our nursing staff with great care. Once you wake, you will discharge to rest at home. Dr. Saman will advise you on what you can and cannot do for up to 2 - 3 days. He will also want to see you within the week for a follow-up appointment to check your progress and to document any issues or signs of infection (rare). During your recovery, should be able to resume normal activities within a week. Postoperative pain is minimal after a brow lift. Most patients report mild discomfort that is easily alleviated by over-the-counter pain medication. Some mild bruising and forehead swelling is expected to show after the procedure and resolves within a few days. Strenuous activities must be avoided as it may affect healing. It is quite normal to feel as though the face is out of symmetry, but within 3 – 6 months, patients will see the optimized results. Happy patients report that they look and feel younger with their brow lift outcome. Why Have a Brow Lift Instead? Having a brow lift instead of a full facelift may be an option for some patients who only have sagging skin in the brow region. 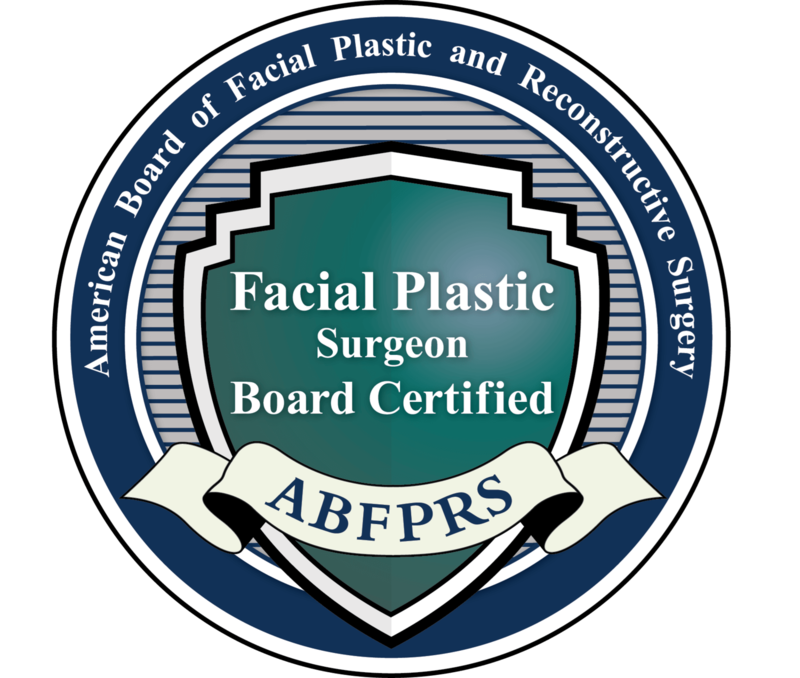 When the patient exhibits additional lax skin in other areas like the lower half of the face and jowls, then a full facelift may be the better investment. We will go over all the options available to you during a consultation session. Keeping an open mind to Dr. Saman's suggestions is essential to the success of your treatment planning session. Will My Brow Look Unnatural? Many of our patients inquire about how "alert" or "bright eyed" their rejuvenated brow will look. Some fear that the surgery will produce a brow that is pulled too far back (like wearing a ponytail too tight) and look unnaturally alert or wide eyed afterward. Dr. Saman is an experienced facial plastic surgeon, who will plan out all of the details of your surgery according to your facial structure and aesthetic goals. No. BOTOX and other wrinkle relaxers can provide you with a temporary improvement of fine lines and wrinkles at the brow, but cannot lift the skin as needed. When you qualify for a brow lift, you will require more than just adjusting the skin to fix a few wrinkles. A brow lift is for patients with significant skin sag at the forehead and brow. BOTOX will not give you the aesthetic results needed when the skin has advanced to this level. You are welcome to try BOTOX injections first to see how your brow responds to the treatment. Will I Have Huge Scars? Dr. Saman will perform your brow lift and make concealing your scar lines as a top priority. The incision will be very thin and usually made within the hairline or your natural brow line. You should follow all of the instructions our staff give you after the surgery to take care of your skin, prevent infection in your incisions, and assist in a faster recovery.